When a security snafu turns his world upside down, Major Matt Riley reunites with his long-lost son. And fourteen years later, the military man is still captivated by his ex, Bethany Trent. Matt must convince her that their new family bond is for keeps—but first, he must keep them alive. Black puts an interesting twist on the secret baby trope with this story of two West Point cadets who fell in love when they were barely out of their teens. 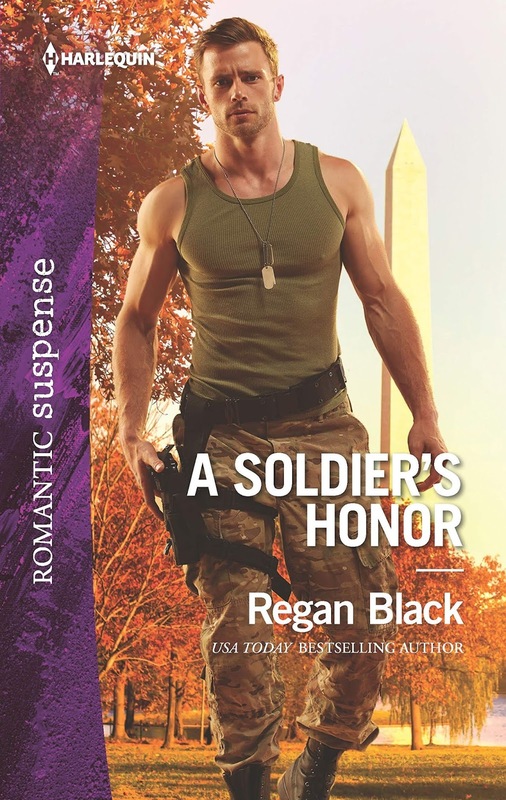 The son of a well-respected Army General, Matt Riley was destined for a career in the military but fell in love with fellow cadet, Bethany Trent. When Bethany became pregnant, she dropped out of the academy, declined Matt's marriage proposals, and swore him to secrecy, determined to raise their baby on her own. At twenty, Bethany was certain that would be the only way to protect Matt's honor, his military future, and keep the two of them from eventually resenting each other. Though Matt disagreed, he reluctantly honored her wishes. Almost 15 years later, their son still knows nothing about his father and while Matt has provided monthly financial support since his birth, he's never seen his son in person, but with the actions of a madman bent on revenge against Matt's father, that's all about to change. 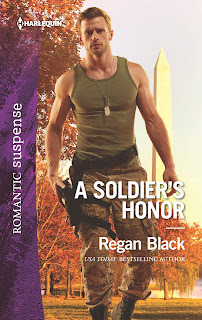 Regan Black launches her new The Riley Code series with a bang. I've been reading Black's romantic suspense novels for a few years now and have come to expect pulse-pounding action with complex characters, deep emotion, and a well-crafted mystery. A Soldier's Honor provides all that and more. From beginning to end, I was on the edge of my seat, anxious to discover what would happen next. Bethany, Matt, and their son, Caleb are all well-developed characters with enough strengths, vulnerabilities, and flaws to make them interesting and relatable. Caleb grabbed my heart immediately though his parents required some reflection, forgiveness, and ownership of the consequences of their earlier decisions before they earned my affection. Once that happened, I was all in and racing with them toward what I hoped would be a happy ending for all. The secondary cast is rich with characters I want to know better, in particular, Matt's friend, Alex and the Riley family. The mystery of who the villain is and how his revenge plot against the Riley family plays out will unfold over the course of the series. I'll be there for every intense, emotional, and action-packed, twist and turn along the way. I haven't read anything by Ms. Black, I look forward to reading this series. Regan Black has been a go to author for me for a few years. I know her books will be full of well developed characters and an interesting, suspenseful story. I look forward to this series. Patricia B. Thanks for the review PJ. Sounds intriguing.